Luminous (lm) and radiant (W) power detectors for the total photometric or radiometric flux measurement of spot and beam emitting light sources like fiber light guides, endoscopes, lasers, LEDs and laser diodes. ISD-5-VL (formerly LSM-9901) Luminous Flux Detector for spot light sources like fiber light guides and endoscopes. 50mm diameter integrating sphere with , 12.5mm measurement port and ODP97 Barium Sulfate coating. Calibration in lm. 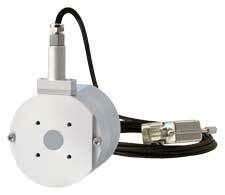 ISD-5-VISNIR (formerly PRW-0505) Detector for radiant power from 400 to 1000nm of narrow beam type sources. 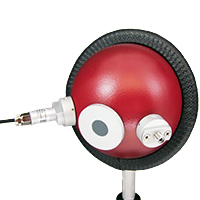 50mm diameter integrating sphere with 12.5mm measurement port and ODP97 Barium Sulfate coating. Calibration in W.
The detectors are supplied with a 2m long coaxial cable with selectable -1, -2 or -4 type connector for use with Gigahertz-Optik's range of optometers. Internationally traceable calibration & certification of luminous flux in lm and radiant flux in W within the specified spectral sensitivity range is provided.